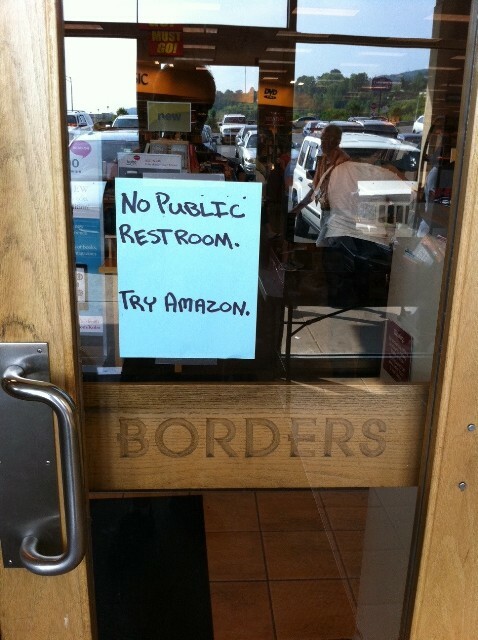 I miss Borders. I can’t believe it’s gone, even though I hold myself almost entirely responsible for its demise. It was me, four years ago, that broke down and bought a Kindle and then fell in love with it, and somehow turned into a one woman marketing department for Amazon, telling everyone I know to get one as well. Now I can barely read a real book without complaining about it. It’s so heavy… I can’t manage to hold it when I’m on an elliptical machine, all that page turning… Ridiculous, and yet, I am spoiled by the wonderful Kindle. But I miss the trips to Borders I used to take. I had a budget for books each month (another reason to love the ebook, the price) and I was very careful about how I spent it. I would walk around Borders for an hour or two just to look at (and smell) all the books. Something about the way Borders displayed their books, and the great people they employed, really worked for me. There are still Barnes and Nobles, yes, but it is really not the same. I feel like B&N barely sells books. Somehow it’s a coffee shop with cds and tons of kid’s toys with absolutely no tie in to literature, and oh yeah, they have books for sale too. They might as well paint faces while they are at it. If you are looking for a real book, it better be a best seller, or B&N probably won’t have it. They will have 2 or 3 books by an author but nothing too in depth and their employees have to look everything up on a computer. That’s another thing – Borders has computers out for you to use to search for a book yourself, at B&N you have to interact with a human. We all know 8 times out of 10 I will just go home and order it on Amazon to avoid that. As chain stores go Borders was amazing, they will be missed. And soon enough we’ll be missing the B&N and our indie bookstores as well.